When it comes to window coverings, rollers are still one of the most popular choices in both residential and commercial premises. The sleek design and simple operating systems make these blinds practical, elegant, and affordable. Modern Blinds offer rollers in a captivating array of fabric designs so you can match your window coverings to your interior décor. Here are 5 tips for choosing new Rollers for your home or business. When choosing your fabric and design, consider the main function of the blind. If you are installing blinds in an area requiring higher levels of privacy and insulation, a block out fabric will give the maximum effect. If you are using roller blinds to dress up a window, you can consider a sheer decorative fabric This way, the blinds will protect your window area while allowing filtered light in. Rollers in bright cheerful designs can be used in kitchen and laundry areas to create a personalised ambience. Vintage fabrics can brighten corners while cheerful designs can be used in kid’s rooms for a pop of colour. Elegant white blinds in the sitting room, study or a commercial setting can really enhance the space while offering respite from harsh sunlight as well as privacy. If operating the blinds is a concern for you, Modern Blinds has simple motorised systems to choose from for optimum convenience. Modern Blinds is now offering the new Vision Roller. This innovative design allows you to choose between a complete privacy screen and a partial filter. By alternating the density of fabric slats from sheer to block-out, you can manage the function of your blinds depending on your daily needs. Blinds in the right places not only keep the temperatures more manageable, they also protect furniture and décor. Prolonged exposure to the sun can fade your cherished belongings. Once you have blinds installed, you can place furniture, paintings and other possessions closer to covered windows where they may be best suited. Whether you want your blinds for the day time or night, for motorised or manual use, the team at Modern Blinds can help you. Our experienced providers also provide blockout roller blinds and a range of different fabrics. 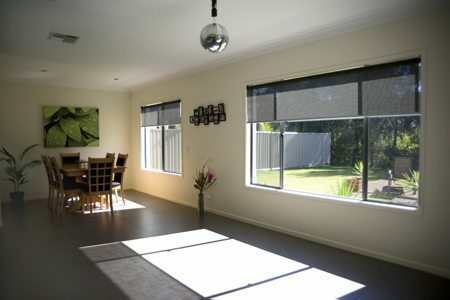 Contact us today to discuss the best roller blinds for your home or business in Brisbane, on the Gold Coast, or beyond!